Home Forward will be accepting applications for 17 of their lists at 12 different communities from June 8 through June 11, 2016. The application period runs from 8:30 am on Wednesday, June 8 through 11:59 pm on Saturday, June 11. Applications will be accepted online, using any internet-connected device. The application can be accessed by visiting Home Forward’s website, www.homeforward.org during the application period. No assistance will be available on Saturday, June 11. 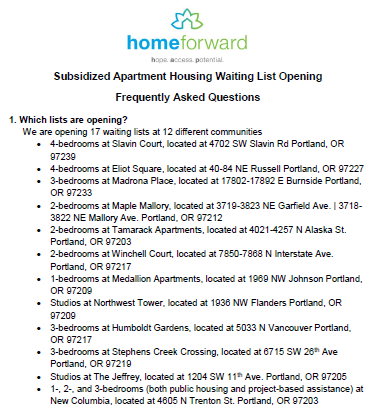 For details, please read the Subsidized Apartment Housing Waiting List Opening Frequently Asked Questions (FAQ) for more information.